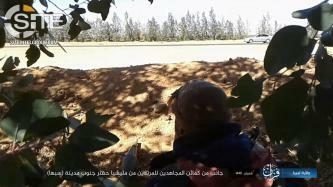 The Fezzan division of the Islamic State's (IS) Libya Province published a photo report of its fighters ambushing "apostates from Haftar's militia" to the south of Sabha. After its spike in operations and estimated enemy casualties during its "Revenge Invasion for Sham Province," the Islamic State (IS) maintained a high number of attacks in the week after, providing a statistical breakdown in Naba 178 for its military data for April 11-17, 2019. The Islamic State (IS) reported in Naba 178 that its fighters in Tunisia beheaded a spy in Djebel Orbata, and also threatened Madkhalis in Libya. Two days after its offensive in the central Libyan town of Fuqaha, Islamic State (IS) fighters in the southwest of the country attacked what are described as "Haftar militia Awakenings," claiming to have killed six elements. The Islamic State (IS) claimed an offensive in the Libyan town of Fuqaha, killing and taking prisoner several "wanted" individuals, in what it dubbed a campaign avenging its formerly held territories in Syria. 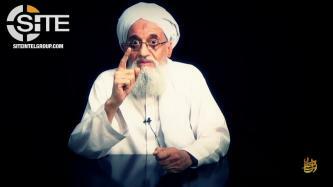 Again dismissing the results of the Arab Spring, al-Qaeda (AQ) leader Ayman al-Zawahiri portrayed true "salvation" as Muslims rallying around fighters and uniting together in echoing their demand for Shariah-based governance. 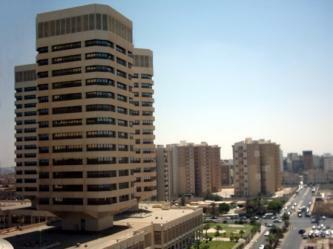 A “security threat” prompted the evacuation of the That El Emad Towers in Tripoli, Libya. In an article in Naba 158 covering the November 23, 2018, attack in the Libyan town of Tazirbu, the Islamic State (IS) threatened more operations in the country and to wage a "new approach" in the war in its cities. The Islamic State (IS) released the 18th episode in a video series providing statistical breakdowns of IS operations, covering in this installment the week of November 22-28, 2018. 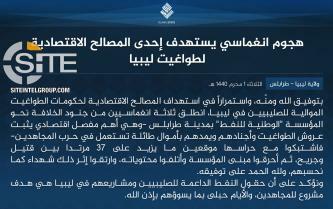 The Barqah division of the Islamic State's Libya Province (ISLP) claimed credit for the raid on the Tazirbu police station and locations in the vicinity, alleging to have killed and wounded 29 "apostates" and taken others prisoner. 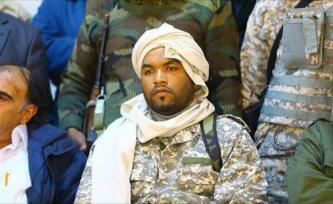 A group of armed men carried out attack on a Sharara oilfield sub-station in Libya. The Islamic State (IS) released through its al-Bayyan Radio the military statistics for 2017-2018 it featured in Naba 148, offering the information in audio and document formats. The U.S. imposed sanctions on Libyan militia leader, Ibrahim Jadhran, responsible for over $1.4 billion in losses to the country’s oil revenue. The Islamic State (IS) released the seventh episode in a video series providing statistical breakdowns of IS operations, covering in this installment the week of September 5-12, 2018. The Islamic State (ISIS/IS) claimed the attack on Libya’s National Oil Corporation (NOC) in Tripoli and further threatened oil targets in the country. 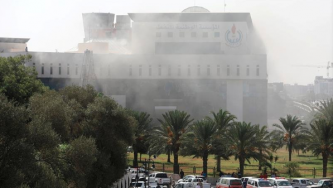 The Islamic State (IS) claimed credit for the attack at the Tripoli offices of Libya's National Oil Company and threatened oil fields and the economic interests of the "tyrants" in the country.